Edible Nail Polish – Tastes Like Chicken! Are you ever tempted to lick your fingers after a particularly tasty meal? If so, this new nail polish is just for you. It’s edible nail polish that brings Kentucky Fried Chicken’s tag line – “Finger Lickin’ Good” – to a whole new level of edible. 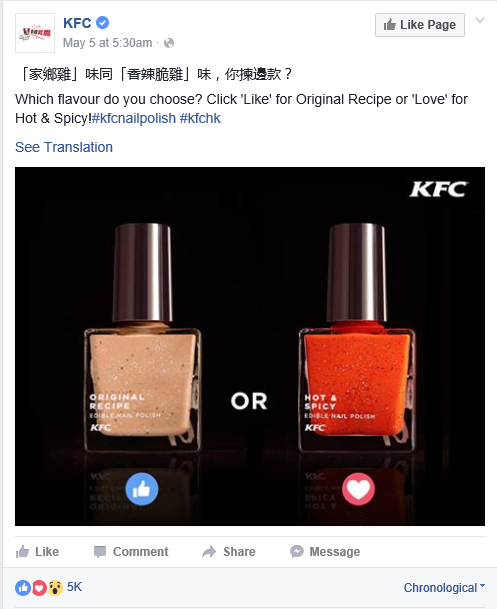 The brainchild of ad agency Ogilvy & Mather and McCormick & Company food experts (who provide spices for the KFC chicken), the recipe was developed to hold the unique KFC flavor and to dry with the glossy coat of most nail polishes. Hong Kong consumers are encouraged to record their preferences as to which flavor should be mass produced. No word on how long the flavor lasts. Query students about their reactions. Will this help the KFC brand? Divide students into teams. Have each group come up with a food product or flavor, and then turn that flavor into a new product. How should this new product be marketed?